To understand why we purchased, and then modified, a tufted-leather storage ottoman for our camper, you first must understand the importance of a tufted-leather ottoman in our daily life. We have an enormous tufted-leather ottoman in our den. It’s so big, in fact, that Cliff’s sister actually slept on it when her house lost power for more than 72 hours in December 2013. We use that ottoman for cocktail hour, as a platform for our tray of snacks and drinks. On Sunday nights, it accommodates our weekly foot rub. Nearly every night, we sprawl out on it as we watch TV. No wonder we wanted a similar object in our home-away-from-home. 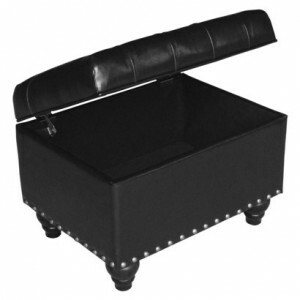 We found the ideal tufted-leather storage ottoman over the weekend and promptly purchased it. Problem was, we didn’t measure it. Although we were fairly certain it would work, it eventually required modifications. Removing the ottoman’s feet, rotating the table leg and adjusting our expectations were the perfect combination. Can’t wait to spread out on our new ottoman for this weekend’s cocktail hour!